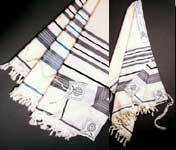 Many people visit Jewish / Messianic Congregations and wonder why men wear prayer shawls (Tallit) & women wear scarves. The answer depends on which group is wearing the Tallit or scarf. 1. It is commanded in Torah (specifically the fringes or Tzitzit). 2. Identification with the Jewish people (Scarf & Tallit). 3. Respect for HaShem (Adonai). 4. Respect for HaShem (Adonai) & His Messiah. 1. Identification with the Jewish people (Scarf & Tallit). 3. Respect for HaShem (Adonai) & His Messiah. 1. Respect for HaShem (Adonai) & His Messiah. The scarf is worn for the same reasons outlined above. While women are not (or may not) be required to wear Tzitzit, the are told to dress modestly. Additionally, women are required to cover the head when reciting prayers. The wearing of Tallit is not legalism as many charge, for no one is saying it is a requirement for a relationship with G-d, or for forgiveness of sins. Following G-d's commands and living a Torah observant Lifestyle is not about earning G-d's Love, for it is freely given through His Messiah. Living a Torah observant Lifestyle is about walking in the steps of His Messiah, who perfectly kept Torah, who Loved Torah and Who is the Living Torah. Many in the Church wear bracelets with "WWJD", we as Messianic Believers choose to do just that, Live as Yeshua Lived, and wants us to Live. To present ourselves as living sacrifices, Holy and pleaseing unto Adonai.